Stuck In The Buckosphere: What's That Falling????? 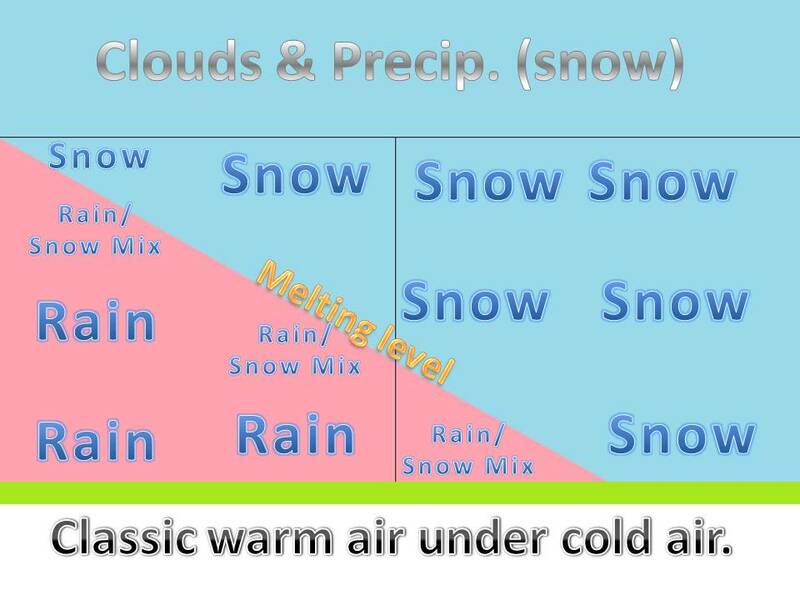 Most people have a hard time understanding the difference between the forms of precipitation, so this will be a little tutorial because it is pretty basic and easy to understand. 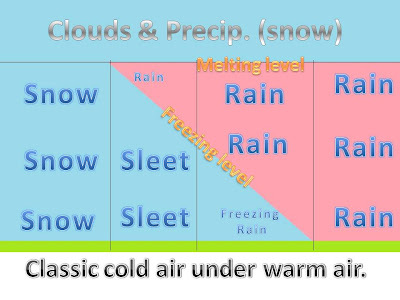 There are two main set-ups for the various forms of precipitation: Cold Air Under Warm Air & Warm Air Under Cold Air. I built two graphics to help demonstrate the proper atmospheric conditions for each to occur. Lets start with the Cold Air Under Warm Air. No matter if is winter or summer, you will find snow in the clouds that are producing any form of precipitation. Starting on the left: you need air that is below or at freezing, 32F, for snow to fall. This way there is no thawing of the snow as it falls from the clouds to the earth. Moving toward the right: The next form of precipitation on the ground is Sleet. The snow falls through a layer or warm air, melts and turns into liquid rain. The rain then falls back into the cold air and refreezes as sleet, or little solid ice pellets. These will bounce off your coat if you are outside in the elements. Continuing right: the third form of precip on this diagram is freezing rain. Many people find it hard to understand freezing rain, so I will try to be very specific. The snow from the clouds melts in the warm air and turns into liquid rain. It falls ALL THE WAY down to the earth as rain, but as you can see, it drops back into the cold air. There is NOT enough time for the rain to refreeze into sleet, so when the liquid rain comes in contact with the ground, grass, or your coat, it instantly freezes into ice. The surface that it is comes in contact is actually below the freezing mark, so once it stops falling and touches it, it begins to freeze immediately. For freezing rain to form, the temperature at the surface has to be at or below 32 degrees. If it is above 32F and rain does not freeze on contact with the surface it is NOT freezing rain. The fourth and final form of precip all the way on the right is rain. The snow will fall from the clouds, melt in the warm air, and stay as a liquid all the way to the ground because it does not encounter any air below 32F. Now on to Warm Air Under Cold Air. 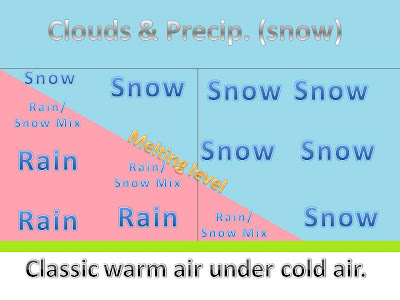 We just finished talking about rain, which is on the left of this diagram, and as you can see, the snow melts into rain. The rain/snow mix occurs very near the Melting Level. When the Melting Level is very close to the surface, you can see that this is where you get the Rain/Snow mix to actually fall to the earth. When there is too much warm air, it melts all the snow into rain, but if the distance is just right, you can get the rain/snow mixture. Then as you can see on the far right, when you get completely freezing air, you get snow all the way from the clouds to the surface of the earth. 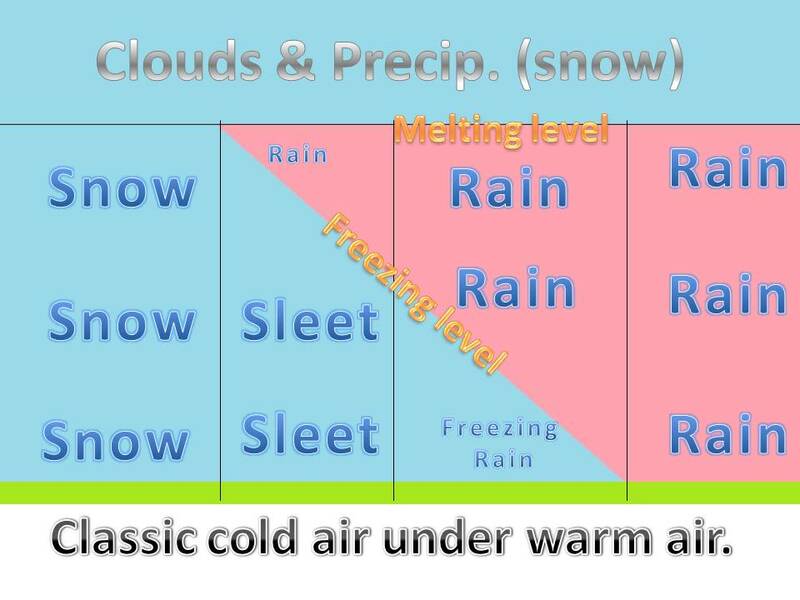 Hopefully this helped clear a few questions up for you, and help you better understand the different forms of precipitation that we will be seeing in the coming months. If you have any questions at all, feel free to comment on this blog because it will send me an email, and I can help you better understand.